Dr. Sandi Cooper, professor of mathematics education, and Dr. Suzanne Nesmith, associate dean and associate professor of science education in curriculum and instruction, approached the principals of Mountainview Elementary and Bells Hill Elementary in Waco ISD with the idea of working with a small group of teachers to understand the importance of STEM for early learners. The schools wanted to take it a step further and include every teacher on both campuses. 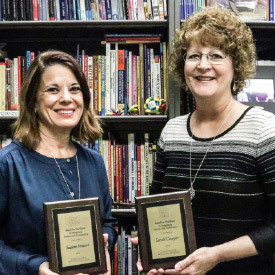 For the past two years, Nesmith and Cooper have held professional development sessions with more than 80 teachers and administrators, along with School of Education student-teacher interns assigned to these schools. The teachers and future teachers learned strategies to integrate STEM into everyday teaching, while also becoming well-versed and capable of supporting their students in the subjects. 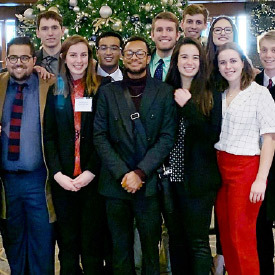 Baylor’s Model United Nations team, which represented the nations of South Africa and Lesotho at the 29th annual American Model United Nations Conference (AMUN) in November, earned Overall Outstanding Organization and also broke a team record for the most in-committee awards received at the annual conference. The AMUN conference brought together more than 1,300 students representing approximately 150 Member States in simulated UN committee sessions, where students take on the role of diplomats, debating about and writing resolutions devoted to reaching international consensus on some of the most pressing global problems. Also in November, the Baylor Model Organization of American States (MOAS) earned top honors. Baylor students represented the countries of the Dominican Republic, Haiti and Jamaica. A Baylor team won Outstanding Delegation (Team Jamaica). A Baylor group also won Distinguished Moot Court Team. Support is provided to the teams by the Department of Political Science and Baylor’s College of Arts and Sciences. To learn more, visit baylor.edu/modelun.